The group must construct a tunnel made from Toobeez. Set up tables and chairs for participants’ use. 1. Arrange the participants so half are on each side of the table(s). 2. Orient the participants to each other and open with a brief discussion about the importance of needing other people in our lives to help meet our goals. Have participants give examples of how they currently help each other. Your group is on a trip to Rocky Caverns, a popular vacation resort when a rockslide occurs blocking the opening to the outside. Help is on the way, but the rescue team is not sure where you are located. If you could build a small tunnel out of the materials you have, you could yell to the outside so the rescue team could find you. You are in close quarters, and you do not have much time! When completed, yell, “We did it!” so the rescue workers will know where to find you! 4. Read the Activity Challenge Box to the group. Activity Challenge: The group must construct a tunnel made from Toobeez. 5. 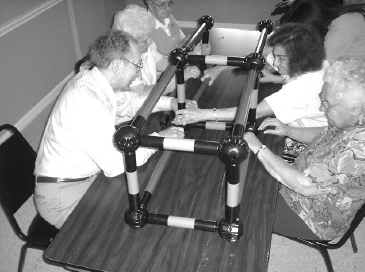 Allow participants to plan and problem solve together while constructing their tunnel. Participants can build any tunnel structure that solves their problem. They do not have to build the exact structure in the pictures. 6. Hand-over-hand intervention may be necessary for some participants. Assist participants who may have difficulty with handling the Toobeez. 7. Encourage the group with verbal suggestions (if necessary) to keep the group engaged. 8. If your group is struggling, or if you feel your group would benefit from an additional challenge, present a variation provided below. 1. Solve the challenge without communication. If this seems too easy, try having the group attempt their tunnel construction without verbal and/or written communication. 2. Have participants use one hand each. This really demands teamwork and teaches humility. This variation is challenging, but perfect, when working with someone who may have lost the use of an arm or hand, making it an even playing surface. 3. Have one person give directions. Have the group select a leader to give directions to the team to construct the tunnel. The leader is the only group member who can speak. For a real challenge, blindfold the group while they attempt the activity. Divide a set of Toobeez in half and have the two teams compete. Provide only certain Toobeez pieces to the participants. Use the larger Toobeez from two sets of Toobeez to build a tunnel large enough for the group to travel through and “escape.” Safety Note: Be sure the tunnel is secure if people are going to travel through it. To be safe, have therapists or able participants hold the tunnel to brace it. 8. Have a time limit. Determine the number of Toobeez and have a time limit within which participants must work. Apply the “no discount” rule; all suggestions in the group are counted and are not put down, reduced or “discounted” in any way, as all group members’ comments are valued. How did it feel to be part of a group trying to reach a goal? When have there been times you were part of a team? Did you need help at times from others? How does it feel to reach (or not reach) the goal?